Have you seen the video of the little 5-year old who uses the word apparently repeatedly in a news interview? On the way to basketball practice tonight, a song came in Klove and I mentioned that it was a song I wanted played at my funeral someday. Me: Really? What will you say? Parker: I don’t have it all figured out yet and I don’t want to ruin it. You’ll hear it soon. P: will someone get me some tea? P: guess I’ll get the tea myself it’s the only option I got. I ask the kids: what are you guys watching? Parker: but it’s not naked people and cuss words. -Mom, your ringing is pathetic. By the way what does pathetic mean? This is just the last month of our life…we don’t have many boring moments around here. Christmas is behind us. It’s time to get organized to start a new year. By nature, I am a messy person, but I long to be organized and it is an ongoing battle for me. Last fall when school was starting, I decided to try menu planning for a month at a time. There were many factors that led to this decision. First of all, I live in a small town with not much options when it comes to grocery shopping. There are only two places to shop and I got tired of the lack of selection or the fact that half the time, if I didn’t watch extra close, I was bringing home out of date groceries. My first step was to research. I wanted to find a good printable menu that I could use each month and enjoy looking at. This is the one I chose. I found it on this blog from a great lady in Australia. Check it out! Next, I wondered how I would fill all these days with great meals. Most days I can’t think of a single thing to cook for dinner. In our house, if I make 3 meals a week, that is plenty for us. We can eat those meals and their leftovers (I cook like I have a family of 8) and be satisfied for the week. I decided I was making it too hard. I sat my family down and asked them what they wanted to eat. It’s a struggle to get my kids to eat so why not put them in charge? I let each kid pick one meal each week. That means we usually have breakfast for dinner at least once a month and usually sneak in some chicken nuggets, but it is all good. My husband and I discuss what sounds good to us and we finish up the month pretty quickly. 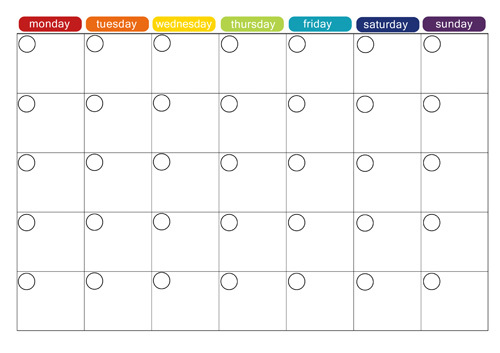 Because of our schedule, it works best for me to make my meals at the beginning of the week. I have found that you do what works for you. If a plan changes and I don’t get a meal made, I don’t stress, I just mark it out and plan to make it later in the month. 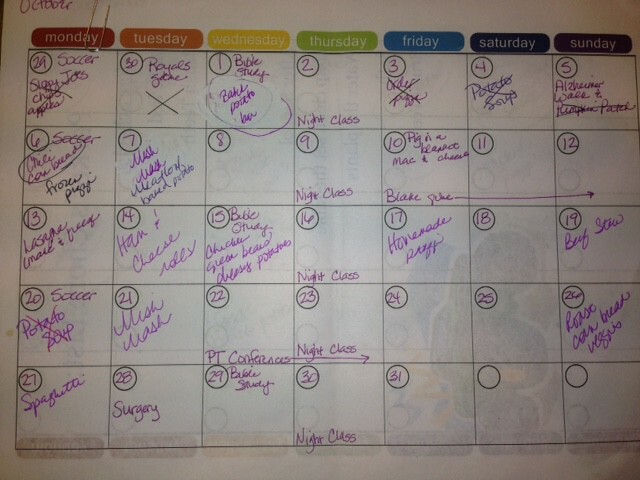 At the end of the month, I look at the meals that I didn’t make and add those meals to the next month. As far as the shopping goes, I tried my hand at extreme couponing and I just didn’t have the patience or the time to deal with that. I do watch the adds and pick up staples that I know I will use when they are on sale, but mostly I just go off my monthly meal plan plus some snacks. If I stick to this, we can easily cut our monthly food budget almost in half. 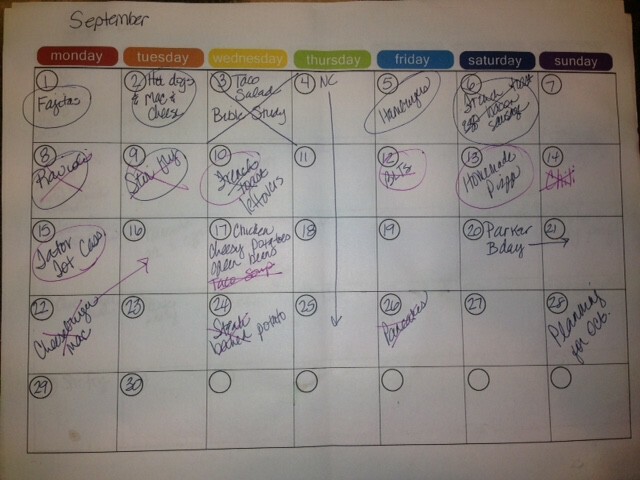 I had worked hard for two months to keep up the monthly meal plan and I loved it. I didn’t have to sit looking in my pantry wondering what I was going to have each day. I don’t waste time throughout the day wondering what I’m going to cook and what I have in the freezer. The guess work is done for me and I just follow my schedule. I was in a good pattern but then I had hand surgery and some unexpected family stuff came up and I just fell off the wagon. I’m looking forward to getting started again in January. Here are two examples of completed meal plans. I put our activities on them so I know when we will be home or not be home. Why am I sharing this? It doesn’t seem like brain surgery. When I would discuss what I was doing with people, they seemed intrigued. I never want anyone to reinvent the wheel so if something I do helps you, that’s great!